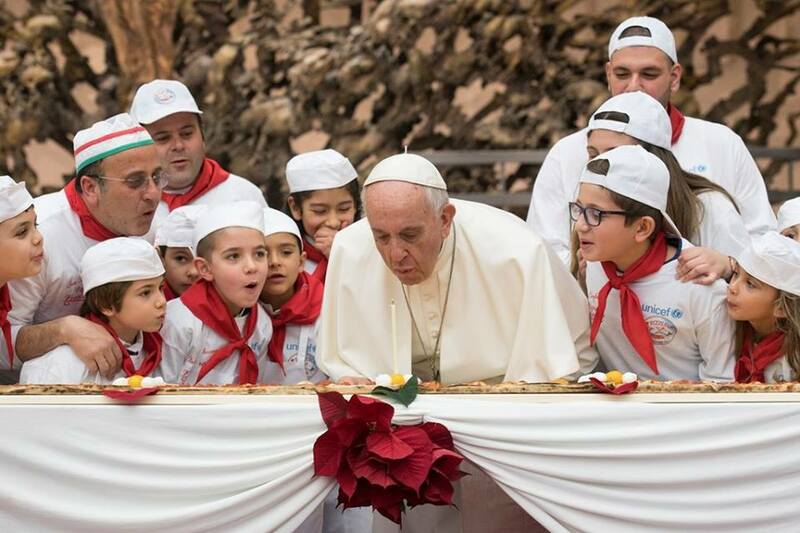 Pope Francis had a birthday party with a group of children being treated by the Pediatric Dispensary of Santa Martain the Vatican. Last year, Pope Francis celebrated his 80th birthday with a group of homeless people at a breakfast at his Santa Marta residence. At 10.30 this morning, in the Paul VI Hall, the Holy Father Francis received in audience the children assisted by the “Santa Marta” Paediatric Dispensary. The joy of children ... The joy of children is a treasure. Joyful children ... And we must do everything to keep them joyful, because joy is like good earth. A joyful soul is like a good earth that makes life grow well, with good fruit. And this is why we celebrate: we always look for the proximity of Christmas to gather together and to hold this party for them. Listen carefully. First: protect the joy of children. Do not sadden children. When children see that there are problems at home, that the parents quarrel, they suffer. Do not make children sad. They must always grow with joy. Are you joyful? [“Yes!”]. I don’t believe it: yes or no? [“Yes!”]. Very good. This is joy. The second thing, for children to grow well: let them speak with their grandparents. The two extremes of life. Because grandparents have memory, they have roots, and it will be grandparents who give roots to children. Please, let there not be rootless children, without the memory of the people, without the memory of the faith, without the memory of the many beautiful things that make up history, without memory of values. And who will help children to do this? Grandparents. May they speak with their grandparents, with the elderly. Do you speak with your grandparents? [“Yes!”]. Are you sure? [“Yes!”]. To ask for a sweet? [“No!”]. No? Tell me… At times, very often, we are left without grandparents, aren’t we? But there are other elderly people who can be our grandparents. Always speak with the elderly. I will ask you a question, answer carefully: are grandparents and the elderly boring? [“No… Yes”] You… [“They give us lots of gifts”]. He’s interested: they give us lots of gifts! They are not boring, they are good. Tell me… [“They love us very much”.] They love us very much. May children learn to speak with the elderly, to speak to their grandparents. And the third piece of advice I give you: teach them to speak with God. Let them learn to pray, to say what they feel in their hearts. Joy, speaking with grandparents, with the elderly, and talking to God. All right? Do we all agree? You too, all right? I wish you a nice day, and a good party. And eat the four metres of pizza: eat well, it will do you good, it will make you grow! And keep going! Thank you, thank you!